If you’re like many tech enthusiasts, you may struggle with escaping the mindset that a low price equals low quality when it comes to purchasing a budget keyboard. However, in many cases, budget keyboards are just as good, if not better, than their premium counterparts. 2. Pictek 104 Keys Anti-ghosting Mechanical Gaming Keyboard Anti-Ghosting 104 Keys. Now that you know what to expect from a budget mechanical gaming keyboard and some history behind some of the top budget brands, you’re ready to choose a budget mechanical gaming keyboard of your own. Below, we’ve assembled six of the best budget gaming mechanical keyboards, each one guaranteed to give you a similar performance as one of the leading models. While most budget mechanical gaming keyboards are short on features, the DBPOWER Mechanical Gaming Keyboard is the exception to this rule. 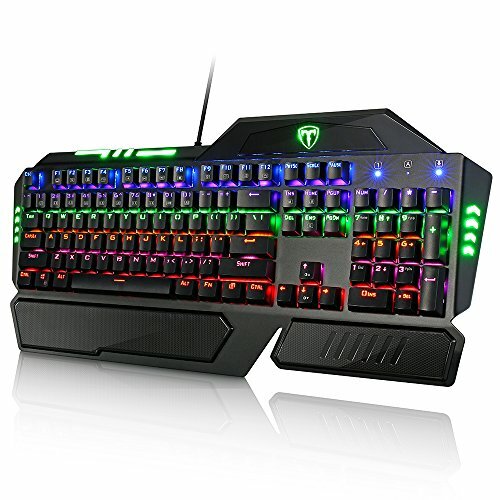 This gaming mechanical keyboard boasts 12 multimedia keys, six different backlight colors with multiple brightness settings for each, an alloy aluminum chassis and an ergonomic design. This budget gaming mechanical keyboard is completely waterproof, so you don’t need to worry about spilling your Mountain Dew all over it. As a plug-and-play device, you don’t need to install any drivers or software before using this mechanical gaming keyboard: Just plug the DBPOWER Mechanical Gaming Keyboard into any available USB port on your PC and you’re ready to game. The DBPOWER Mechanical Gaming Keyboard works with a variety of operating systems, including Windows 10, Mac OS and even legacy operating systems such as Windows XP. The Pictek 104 Keys Anti-ghosting Mechanical Gaming Keyboard puts an emphasis on durability, as this keyboard is both waterproof and dustproof. For gamers who like to give their hardware a deep clean, each of the key caps on this mechanical gaming keyboard are fully removable, which makes it make easier to clean between each one. With only minor maintenance, the Pictek 104 Keys Anti-ghosting Mechanical Gaming Keyboard will last for at least 50 million key presses and uses high-quality material to ensure your keys will never fade. You’ll have no problem with this budget mechanical gaming keyboard sliding around your desk as you game thanks to the combination of ABS plastic and metal used in its construction. The HAVIT HV-KB389L RGB Backlit Wired Mechanical Gaming Keyboard may not look as stylish as other gaming mechanical keyboards, but what it lacks in style, it makes up for in features. This budget mechanical gaming keyboard uses a custom variation of the Cherry MX Brown mechanical switches to give you an edge when it comes to FPS and MOBA games. Unlike other budget mechanical gaming keyboards, the HAVIT HV-KB389L RGB Backlit Wired Mechanical Gaming Keyboard also includes a small number of programmable keys, a feature usually reserved for high-end gaming keyboards. The ability to lock the Windows key will help ensure that you don’t accidentally tab out of your game during an intense multiplayer match. Unlike other budget mechanical gaming keyboards that use proprietary custom mechanical switches, the Rosewill Mechanical Gaming Keyboard uses official Cherry MX Red switches under each of its keys. 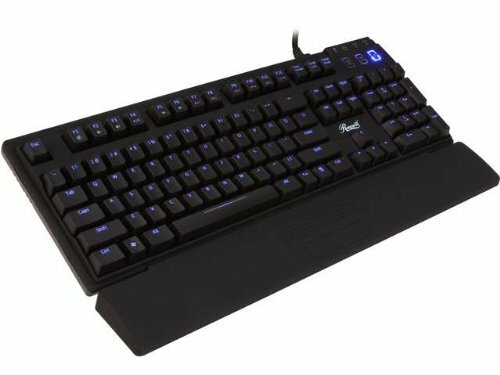 That’s not the only high-quality feature this budget keyboard offers, as the Rosewill Mechanical Gaming Keyboard also has an N-key rollover function, multimedia keys, shortcut keys, a Windows key lock and a gold-plated USB connector. 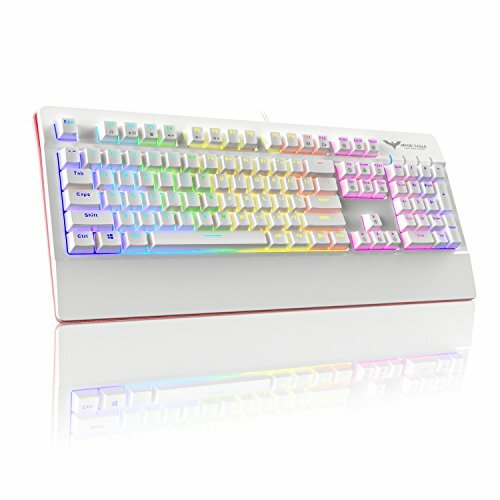 Lastly, the Rosewill Mechanical Gaming Keyboard has rubber pads attached to its underside, guaranteeing that this keyboard stays put on your desk no matter how hard you mash the keys. 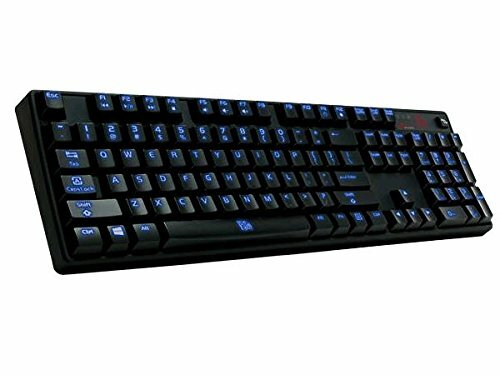 As it says in the name, the Tt eSPORTS Poseidon Z Blue Switch Illuminated Keyboard is a budget mechanical gaming keyboard designed for the eSports crowd. 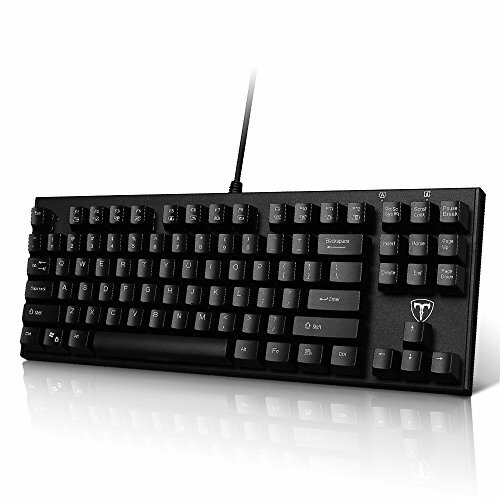 This mechanical gaming keyboard uses a custom Tt eSports Certified Mechanical Blue Switch that is both durable and provides quick response times. In fact, the manufacturer even claims these proprietary switches are more responsive than any other type of switches available on the market! With additional features such as multimedia keys, anti-ghosting capability, LED lights under each key and a gold-plated USB cable, it’s easy to see why the Tt eSPORTS Poseidon Z Blue Switch Illuminated Keyboard is a perfect fit in the setups of professional gamers worldwide. Are Budget Keyboards Good for Gaming? One of the old adages that you hear from a young age is “you get what you pay for,” which many consumers have taken to mean that if something is a low price, it’s that price for a negative reason. For example, some gamers may think that a low-priced mechanical keyboard is one that will quickly fall apart after a few months of use, or that numerous corners were cut to establish a lower price than the competition. However, that couldn’t be further from the truth. Simply put, a cheap keyboard doesn’t sacrifice quality to achieve a low price, instead cutting down on extra features. While you’ll still get high-quality mechanical switches under each key, a weighted feel and a keyboard constructed out of a durable material, you’ll sacrifice features such as a built-in USB hub, customizable backlights, programmable keys and specialized software. If you’re the type of gamer who just wants to use mechanical switches to give you an edge when gaming and doesn’t mind cutting out extraneous features, an affordable mechanical keyboard is a perfect choice. One other thing you may notice about budget mechanical keyboards is that unlike the best mechanical keyboards, many of them do not use the industry standard Cherry MX mechanical switches, opting instead for a proprietary design. In many cases, these proprietary mechanical switches function just as well as the Cherry MX switches; in a worst case scenario, you may notice a very slight difference between the two types of switches. Are There Any Disadvantages To Cheap Gaming Keyboards? While budget mechanical gaming keyboards are a great fit for the majority of gamers, if you’re someone in the eSports professional gaming scene, you may want to consider going with a high-end mechanical gaming keyboard instead. Many of the extra features in a high-end mechanical gaming keyboard, such as macro keys, are a necessary component when it comes to dominating your opposition. While your average gamer who enjoys the occasional multiplayer bout won’t necessarily need these added features, when a large cash prize is on the line, you’re going to want every extra feature you can get. As noted before, there are no actual disadvantages between a budget mechanical keyboard and a high-end model when it comes to durability and only a minor gap when it comes to the quality of the mechanical switches. If you’re just looking for a mechanical keyboard to play games leisurely or to help you become a better typist, you’ll find a budget mechanical gaming keyboard will suit your needs perfectly. Brands like Logitech, Razer and Corsair are some of the most well-known brands when it comes to gaming hardware, and these names are likely to be some of the most represented brands on a store shelf. However, when looking at budget mechanical gaming keyboards, you’ll notice a wide variety of brands you’ve likely never heard of, such as HAVIT, Rosewill and DBPOWER. Despite these brands not being household names, many of these companies have decades of experience under their belt at selling high-quality hardware at a low cost, including mechanical gaming keyboards. Below, you’ll find a brief profile of three of the most well-known names in the budget hardware sector. First established in 1998, HAVIT is a Chinese company that services more than 160 countries. While HAVIT specializes in equipment designed primarily for commercial businesses, recently the company has begun to branch out into areas such as mechanical gaming keyboards. By using simple designs and cutting out extra features, HAVIT can provide high-quality hardware at a budget price. If you’re one of the many PC gamers who built their PC from the ground up, Rosewill is likely a familiar name. Rosewill prides itself on offering a variety of high-quality computer parts at low prices and is particularly known for their extensive lineup of computer cases. The engineers at Rosewill are always looking on how to improve their products, such as finding ways to reduce the cost without comprising the quality. Rosewill’s mechanical gaming keyboards are some of the best budget-priced keyboards available. Based out of the United Kingdom, DBPOWER dabbles in nearly every area of consumer electronics, including PC hardware, drones, phone accessories and even kitchen appliances. DBPOWER offers an extensive warranty on all of their products as they stand 100 percent behind the products that they sell. Similar to Rosewill, DBPOWER is constantly tweaking and innovating its products to offer the best possible products at the lowest prices.